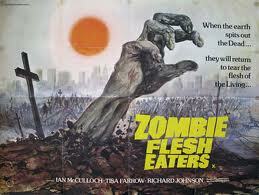 Zombie Flesh Eaters are Coming! 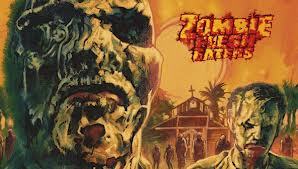 The 1979 movie (also known as Zombi 2 and Zombie among other names) gained notoriety after going the Banned List back in the 80’s, leading a string of horror loving teenagers (myself and Zombie1 included) to seek it out by whatever means possible to experiance the full gore and more. 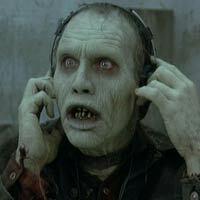 It’s safe to say we were not disappointed, leading to it ranking in our Top Ten Zombie Movies List. The film remains highly influential among horror directors and fans alike. 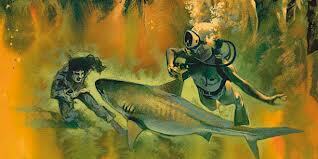 In fact, the mere mention of the shark vs zombie scene is enough to get any Zombie Flesh Eaters fan going. Painstakingly restored from the original camera negative, Zombie Flesh Eaters stands- out as one of the amazing Arrow distributors biggest ever (and best looking) restoration projects. These landmark releases will contain a wealth of special features, additional collector’s material and never-before-seen extras, including optional English / Italian opening titles, a UK exclusive introduction to the film from lead actor Ian McCulloch, and a number of brand new featurettes. – “FROM ROMERO TO ROME: THE RISE AND FALL OF THE ITALIAN ZOMBIE FILM” – Veteran Fulci screenwriters Dardano Sacchetti (THE BEYOND) and Antonio Tentori (CAT IN THE BRAIN), celebrated UK critic Kim Newman and filmmakers Luigi Cozzi (CONTAMINATION), Ruggero Deodato (CANNIBAL HOLOCAUST), Russ Streiner (NIGHT OF THE LIVING DEAD) plus many more share memories of the genesis of corpse-crunching cinema – from Romero’s early templates to the gory glory days of Fulci and his many successors. – “THE MEAT MUNCHING MOVIES OF GINO DE ROSSI” – The special effects magician behind many Italian splatter classics talks about his most famous gore-drenched greats – and shows props from many plasma-packed masterworks – including ZOMBIE FLESH EATERS, CITY OF THE LIVING DEAD, THE HOUSE BY THE CEMETERY, CANNIBAL FEROX, BURIAL GROUND and PIRANHA II. – “ZOMBIE FLESH EATERS – FROM SCRIPT TO SCREEN” – Dardano Sacchetti shows key pages from his original ISLAND OF THE LIVING DEAD screenplay. – Collector’s booklet featuring brand new writing on the film by Fulci biographer Stephen Thrower, a new interview with star Olga Karlatos by Calum Waddell, a history of Zombie Flesh Eaters and the BBFC by Craig Lapper , one of the board’s senior examiners, and extracts of the original ‘Nightmare Island’ 1978 script including unfilmed, alternate, and more gory sequences as well as a Lucio Fulci CV compiled by Jay Slater. – “MUSIC FOR A FLESH FEAST” – Q&A with composer Fabio Frizzi from the Glasgow Film Theatre in August 2012, hosted by Callum Waddell and Nick Frame. past the classification board. 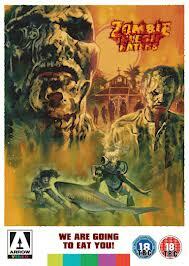 These new high definition restored editions contain the full unedited film, as Fulci made them to be seen.